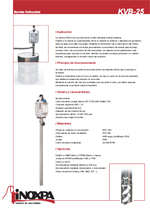 The KVB-25 pumps are hygienic vertical progressive cavity pumps. They are specially designed to transfer media of either high or low viscosity from tanks and barrels by means of a pump tube introduced into the drum. Some of the most important applications of this pump type is transferring of fruit concentrates for the beverage production, tomato concentrate for the ketchup production, transferring of creams, honey and other media of high viscosity. Pumping is characterised by a gentle transfer of media with shear sensitive particles. 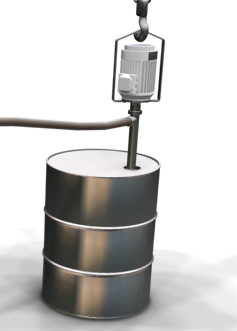 The pump tube is introduced into the drum with the media to transfer. Friction between the stator and the rotor creates vacuum at the inlet of the pump thus facilitating the entry of the product into the pump. The turning motion of the rotor makes the cavities between the rotor and the stator move forward and transport the product to the outlet. Internal single mechanical seal EN 12756 (DIN 24960 L1K). Impulsion connection BSP 1 ½". Pump tube diameter 54 mm. Drive: Motor 1,5 kW 1000 rpm. Stator: white NBR and EPDM (white or black). Gaskets: EPDM (FDA certified) and FPM. Drive: motors at 900 rpm. Drive: geared motor or variable speed drive. Other connections (Clamp, DIN, SMS, RJT…). Summary Debido a su diseño es especialmente útil en el vaciado de bidones y depósitos de productos tanto de baja como alta viscosidad, mediante la introducción de la caña dentro del mismo. Summary They are specially designed to transfer media of either high or low viscosity from tanks and barrels by means of a pump tube introduced into the drum. Summary De part sa conception, elle est particulièrement adaptée pour vider les containers et les cuves de produits ayant une viscosité faible ou élevée, en introduisant la pompe directement à l'intérieur de celui-ci. Summary A seguito del suo particolare disegno, è specialmente utile nello svuotamento di bidoni e serbatoi di prodotti sia di bassa che di alta viscosità, attraverso l'introduzione del tubo nel serbatoio stesso. Summary Конструкция насоса была спроектирована для откачивания сред из бочек посредством насосного патрубка, помещённого в ёмкость. Summary Este manual contiene información sobre la recepción, instalación, operación, montaje, desmontaje y mantenimiento para la bomba kiber KVB. 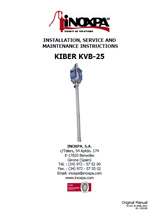 Summary This instruction manual contains information on the reception, installation, operation, fitting, stripping and maintenance for the kiber KVB pump. Summary Ce manuel contient des informations concernant la réception, l’installation, le fonctionnement, le montage, le démontage et l’entretien de la pompe kiber KVB. Summary Niniejsza instrukcja zawiera informacje dotyczące odbioru, instalacji, użytkowania, montażu, demontażu oraz konserwacji pompy śrubowej typu KVB. Summary Данное руководство содержит информацию о приемке, установке, работе, монтажу, демонтажу и обслуживанию насоса KIBER KVB-25.